Te Keepa, or Major Kemp, as he came to be known, was a chief of Muaūpoko, Ngāti Apa and Whanganui. He was born in the early 1820s. This was a time of great upheaval and conflict as Ngāti Toa, Ngāti Raukawa and Te Āti Awa migrated southwards. In 1848 he was involved in the sale of the Whanganui block, and later he joined the Armed Police Force. By 1862 he was regarded as a leading supporter of the government. In the mid-1860s Te Keepa fought against the Hauhau (followers of the Pai Mārire religion). This conflict took place along the Whanganui River and in South Taranaki. He was promoted to major, and his troops were regarded as an elite force. 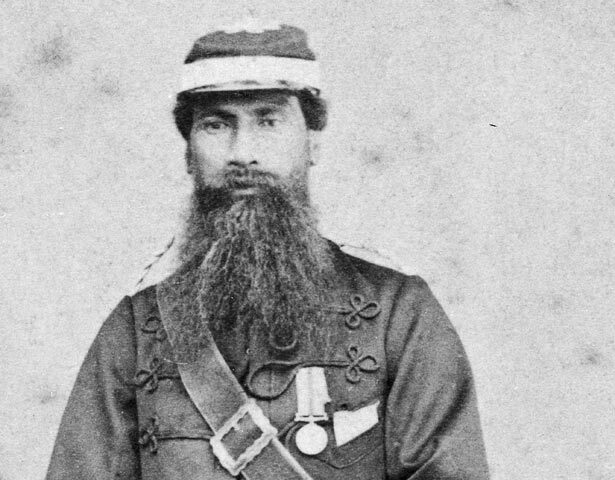 In 1868–69 Te Keepa and his troops were fully involved in the campaigns against Te Kooti and Tītokowaru. During the campaign against Tītokowaru Te Keepa and his men were alone among government forces in distinguishing themselves. In 1869 he was presented with the Queen's sword of honour, and in 1874 and 1876 he was awarded, respectively, the New Zealand Cross and the New Zealand War Medal. Despite these signs of European respect, Te Keepa's main influence remained within Māoridom, where he was equally respected for his military skill. In 1865 Te Keepa was made a Native Land Court assessor, and in 1871 he was appointed a land purchase officer. He later risked his career by attempting to reverse the humiliating defeats of the Muaūpoko people in the 1820s by Ngāti Toa and other tribes. His battle-hardened veterans built a pa at Horowhenua, and there were violent clashes. The Native Land Court later significantly extended its award to Muaūpoko. One historian has noted that the judge’s decision was "powerfully assisted" by Te Keepa's threats of further action. In the 1880s Te Keepa became an opponent of land-selling. He used his mana and authority in an attempt to increase Māori independence and control of their dwindling lands. In 1880 he tried to set up a Māori land trust at Wanganui. Sales would not be permitted, and the land would be administered by a Rūnanga (committee). But this, and other efforts to develop land in partnership with Europeans, came to nothing, largely because the Native Lands Acts failed to recognise or promote such enterprises. Te Keepa later became active in the Kotahitanga movement. This sought to implement the Treaty of Waitangi, abolish the Native Lands Acts, and achieve a degree of Māori local self-government. He died in 1898. He rangatira a Te Keepa – a Major Kemp rānei ki ngā Pākehā – o ngā iwi o Muaūpoko, o Ngāti Apa, o Whanganui. I whānau mai ia i ngā tau tōmua o te tekau tau atu i 1820, i te wā o te riri, o te hiki a ngā iwi pēnei i a Ngāti Toa, a Ngāti Raukawa, a Te Ātiawa ki te tonga. I te tau 1848 i whai wāhi ia ki te hokonga o te poraka ki Wanganui, nō muri ka uru ia ki ngā Pirihimana Mau Pū. Kia tae ki te tau 1862 ko Te Keepa tētahi o ngā rangatira tautoko i te kāwanatanga. I te pokapū o te tekau tau atu i 1860 i te pakanga a Te Keepa ki ngā Hauhau (ngā kaihāpai i te whakapono Pai Mārire). Ka tū ngā whawhai ki te awa o Wanganui, ki te Tonga hoki o Taranaki. Ka kake a ia ki te tūranga hei meiha, ka tirohia ana toa pēnei i te mea nei ko rātou ngā toa o ngā toa. I te 1868-69 kei reira anō a Te Keepa me ana toa, kei ngā pakanga ki a Te Kooti me Tītokowaru. I ngā riri ki a Tītokowaru, ko Te Keepa rātou ko ana toa anake ngā hōia a te kāwanatanga i tū kaha i te matawhāura. I te tau 1869 ka whakawhiwhia a ia ki te hoari hōnore a te Kuini; whāia, i ngā tau 1874 me te 1876 ka whakawhiwhia a ia ki te Rīpeka o Niu Tireni me te Mētara o Niu Tireni mō Tūmatauenga. Ahakoa anō ēnei tohu rangatira a te Pākehā, nui te mana o Te Keepa ki roto i te ao Māori mō tōna tohungatanga ki te whawhai. I te tau 1865 ka tohungia a Te Keepa hei āteha mō te Kōti Whenua Māori, ā, i te tau 1871 ka tohungia a ia hei āpiha hoko whenua. Kātahi ia ka huri ki te whai utu mō Muaūpoko i ngā pakanga me ngā hingatanga ki a Ngāti Raukawa me ētahi atu iwi i te tekau tau atu i 1820. Whāia, ka tū te pā o ana toa kua pūkengatia rā ki te whawhai, ki te taha o te moana o Horowhenua. Heoi, he riri motumotu noa iho te riri. Nō muri ka hoki anō te Kōti Whenua Māori ki te whakawhānui i ngā whenua i whakaritea mō Muaūpoko. E ai ki tētahi tumu kōrero, he “āwhina nui” ki te kaiwhakawā i roto i tana whakatau te kī taurangi a Te Keepa, ki te kore e eke ki tā Muaūpoko i hiahia ai, ka haere tonu ngā rīriri. I te tekau tau atu i 1880 ka ātete a Te Keepa i te hokonga whenua. Ka whakahau a ia kia kaua e hokona ngā whenua e toe ana, me tū motuhake te Māori. I te tau 1880 ka ngana ia ki te whakatū i tētahi kaitiaki whenua ki Wanganui. Kāore e whakaaetia te hoko whenua; ka tōpūngia ngā whenua i raro i ngā whakahaere o tētahi Rūnanga. Hauwarea tēnei me ētahi atu kaupapa whakapai ake i ngā whenua i runga i te mahi tahi me te Pākehā, nā te mea kāore i arongia e ngā Ture Whenua Māori. Nō muri ka kuhu a Te Keepa ki te Kotahitanga, i ngana kia whakamanaia te Tiriti o Waitangi, kia whakakorea ngā Ture Whenua Māori, kia whai wāhi anō te Māori ki te whakahaere i a ia anō. Ka mate ia i te tau 1898. We have 40 biographies, 5 articles, 2 comments related to Te Keepa Te Rangihiwinui. Is your lineage through Keepa Te Rangihiwinui and Mere Kingi? There are some paintings at the Whanganui Museum. His NZ cross is at Waiouru Museum. His sword is at the Muaupoko Tribal Authority in Oxford Street, Levin.